While using WordPress, I’ve seen a very cool effect when I either approved or deleted comments. When you click “Delete” it uses AJAX to call the PHP script that will perform the action as well as highlighting that row with a fading color change effect. If you are a web developer and need to implement a similar approach in your scripts (using AJAX with UI state effect) then this post is for you. We’ll need jQuery and jQuery UI Effects (for the background fading) libraries for this. AJAX Form Pro v2 with Admin Panel is officially released! After over 2 months of development, I’ve finally launched the new version of AJAX Form Pro with Control Panel. It basically lets you create secure web forms, easy & fast in a matter of minutes. Thus, I’ve decided to improve the application and make it easier to use for everyone whether he/she is a beginner, intermediate or a professional web developer. The form’s name & description, configuration and fields are all editable from the Control Panel. 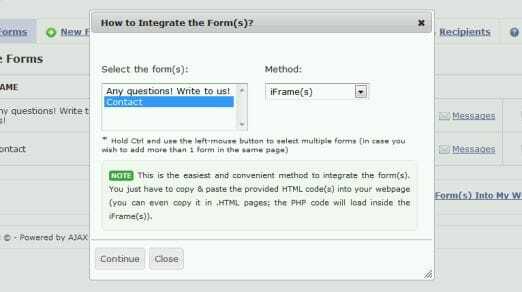 With just a few clicks you can add the form you wish in your web page either by loading inside an iFrame (the easiest way to integrate it) or by copying blocks of PHP code into your page. 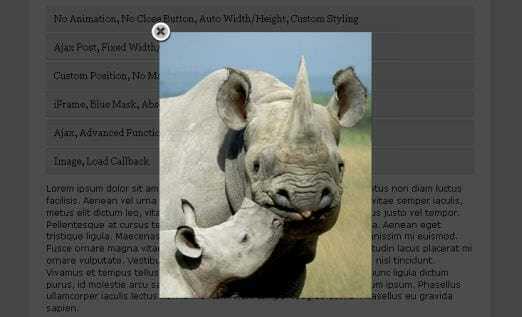 TinyBox2 is a lightweight (under 5 kb) modal box script that supports iframes and images natively. You can POST using AJAX as welll as callback functions can be passed for load and close events. Clicking ESC will close the modal window. The default styling can be overridden by setting CSS IDs. The script is executed by passing an object due to the large number of options. There is nothing to initialize. You just have to call the function on whatever mouse or browser event you like. Why are Admin Panels so Important? Web administrators and web designers don’t realize how important admin panels are until they starting using one of the best admin panels available. Using the wrong type of admin panel can have an impact on productivity and results. What people fail to realize is admin panels are just as important as the functionality of the website and project itself. Installing the right type of fully customized admin panel will lead to an overall increase productivity. Most people don’t know what they are missing until they switch and start using one of the best CP templates on the Internet. Admin panels should be easy-to-use, but advanced enough to allow web administrators the ability oversee every aspect of a website and project. Admin panels are supposed to make administering a website or project easy not difficult. With over 100+ themes to choose from, why settle for less than the best? Catch404 is a jQuery and CSS3 Modal Plugin for showing broken links and 404 errors without users even having to leave the page after they click the actual link. The plugin uses the power of AJAX to check the target clicked link in the background. If the URL is not broken nor generates a 404 error, then the page will load for the user. Otherwise, the visitor would be prompted through an Inline jQuery Modal Window that he is trying to access a non-workable URL address. Let’s pretend that this is a broken link. Can you imagine that when your users click this link, instead of them being redirected to a 404 error on your site, a friendly modal message pops up on your current page saying that it’s not available?. In that same message box you can then give them a sense of direction so that they’re not lost – you could ask them to click on a contact link to report the link’s broken, offer an alternative mirror, recommend they do a site search for the file or just say that you’re experiencing hosting issues and the file will be back up soon.